Debriefing: A Powerful Problem-Solving Tool (For the Whole Family) | The Brain-Based Boss. ← How Can You Make Your Own Luck When It Comes To Recruiting And Retaining The Best Employees? 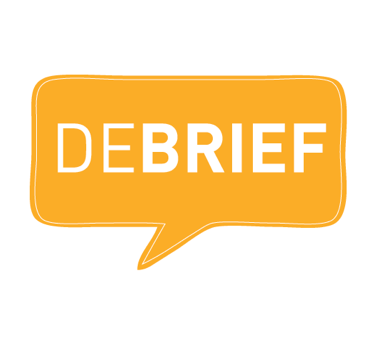 I hear a lot of people using the word ‘debrief’ and its meaning seems to vary wildly. In that sense, the word ‘debrief’ is much like the word ‘spicy’ or the word ‘love.’ I try to consistently summarise the meaning of it in my workshops, not just because we’ll use it in the workshops but because it’s one of the most useful things you’ll ever learn in life, not just for work, but for situations where things happen and you’d benefit from learning afterwards. That applies a lot outside work (hopefully.) Relationships and families could well do with that skill. It’d certainly give us something to talk about over compulsory Sunday night family dinners. Review 4 key questions: What were we trying to accomplish? ; Where did we hit or miss our objectives? ; What caused our results? ; What should we stop / start / continue doing? Posted on July 7, 2015, in Behaviour, Change, Communication, Employee Engagement, Leadership, Personal Productivity, Professional Communication, Self Improvement, Team Building, Team Leadership, Teams, The Brain-Based Boss and tagged debriefing, experiential learning, learning, meetings, Problem Solving, problem solving tool, what successful people do. Bookmark the permalink. Leave a comment.